Rising health care costs, state insurance requirements and budget restrictions — these are the challenges you face every day. Pupil Benefits helps you manage that uncertainty and provide your district with comprehensive coverage. We proudly protect nearly 700,000 students and 400 school districts in New York State. With eight decades of experience providing student accident insurance in New York, you can rely on us as a valuable partner in your school district. 1932 – The first athletes were covered in the fall of 1932 for $.40 cents per student. Sixty schools bought coverage for 1255 students being offered by the New York State Public High School Athletic Association. 1941 – In 1941 the growth and popularity of the coverage raised the awareness of the NYS Insurance Department. 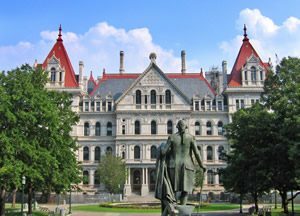 Deemed a viable insurance option, a separate corporation was formed that reported directly to the NYS Insurance Department. The corporation became Pupil Benefits Plan, Inc. once K-12 coverage was added. To the surprise of many experts in “the field”, there is a statute in the McKinney’s Consolidated Laws of New York adopted specifically for the Plan, a very rare occurrence. 1950 – Initially operating out of Manhattan, the Plan eventually moved to the Albany area in 1950, residing here ever since. We are governed by a 24 member Board. They each volunteer their time and their combined experience as School Superintendents, Business Managers, Athletic Administrators, Physicians, Dentists and other public professionals, instrumental in shaping the direction of the organization. In all there has been only five Executive Directors since the inception of the Plan. Our mission has always been simple: Be certain the Plan functions for the schools, by the schools and through the schools. Today – Our membership is strong with over 55% of New York districts utilizing what is essentially their own plan, thus forming a sizable consortium. Our members are most important. Without their support we couldn’t accomplish our goals. It was once said, “With the concept of maintaining a strong membership being first and foremost, it will always enable the Plan to take care of the unfortunate things that happen to some of them”.